When I finished reading Beasts and Men, I flipped through the pages rereading passages and sentences I had underlined, and notes I had made in the margins. I underlined at least one sentence in each story, and in most I underlined several. I thought about writing down the sentences here or maybe transcribing my notes for this review, but I decided against it because I don't want to give that much away. Curtis Smith tells these stories with no detail wasted. Each story is human, purposeful, and masterful. Smith's compassion and diversity of understanding the human experience is comparable to how well William Gibson understands Tokyo. His attention to detail reminds me of Eugene Marten, and his smoky voice hearkens to Raymond Chandler. I found it odd that the cover artist Suzanne Stryk has a page-long biography in the back of the book after Smith's much shorter biography a page before. Her piece, Collecting the Wild III, was used by permission—hence not created specifically for the book—and that's the only thing I found weak here: a cover that doesn't do the text justice. 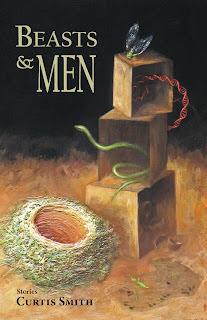 Purchase Beasts and Men HERE. Reviewer bio: Ben Spivey is the author of two books, Black God (Blue Square Press 2012) and Flowing in the Gossamer Fold (Blue Square Press 2010). His writing has been published in places like elimae, PANK and Abjective.